Oh dear, poor you. 15 years is impressive and I'm sure you and he had lots of love to share in all that time, but still, it is never enough, I know. Do you have pics to share or does it hurt too much yet? To answer your question, I'm sitting here typing this with tears in my eyes, and Diva passed in 2008 and Basic in 2014 so no, it never goes away completely, or at least it didn't for me. But with time, I managed to smile more as I remembered the many happy moments and the pain faded to just a dull ache. My heart goes out to you, the first few months, when you still listen automatically when you come home and wonder at first why there is no sound of paws rapidly approaching, are the worst. Caya: Thank you so much for your Empathy; your Sympathy; and your Kind Words; they are very much appreciated! It probably is a bit too painful, to post pics of our dear little boy; at this stage, anyway; And I'm very sorry for the loss of your beloved ones: Diva, and Basic. My wife and I believe that we are receiving "SIGNS" from our little departed boy (SASHA)! We think we hear little noises and barks, and see flashes of white! He was a little MALTESE-POODLE Cross, and had nice white curly hair. Yes, we will never fully recover, but as you say: our grief and hurt will probably turn into a dull ache. Some people have advised that we get another dog: as soon as possible, but I think it's going to take us a while to grieve fully for our little Sasha! He will always be in our hearts; But eventually: one day: we may get another dog. Anyway, thanks so much for your kind words and empathy and support, once again. Thank you for sharing your and Sasha's story with us, Douglas. I know talking about it isn't easy - it's not for me, and it's been years, how much worse must it be after a couple months. I understand that you need time to grieve till you can even think of getting another dog. You'll know when you're ready, I promise. The moment will come when there's another dog who you come across (even if it's just a picture) and they won't let go of your hearts and minds till you bring them home with you, like we did with our former Turkish street dog hellion, Lilly, who has since kept us busy. And I understand what you mean about signs. 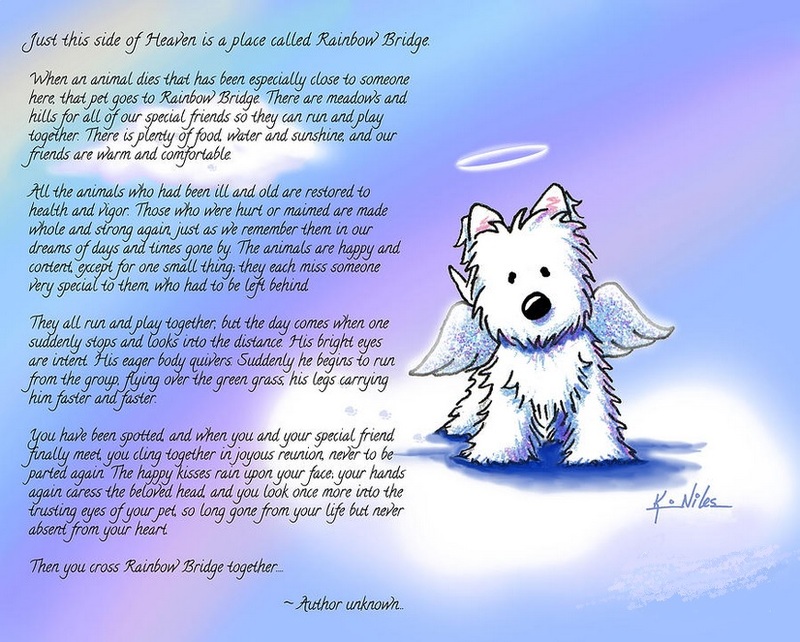 I am quite happily agnostic, but I choose to believe in the Rainbow Bridge because damn life would be way too depressing otherwise. I suspect that the people who've been urging you to get another dog right away think it'd be a "replacement" -- not realizing that each individual (of any species) is unique. Caya is right, you'll know when you're ready, or else a dog will just show up and adopt you. I must admit to becoming more philosophical over the years, because cats go by so quickly. At this point there are more cats out in our little back-yard cemetery (seven) than there are in the house (five). I still remember each one wistfully, and grieve each time another one passes on, but it's gradually becoming less traumatic. Thanks so much for your kind words, and also for the insights into getting "signals" from our departed pets. Yes, I agree with you and Caya: I'm sure that our Sasha will let us know when he feels that it's the right time for us to get another dog; And I'm very sorry and sad to know of your losses of your beloved pets, too. Aw: that's lovely: about Basic! And I know what you mean; Well, we had our little Sasha cremated by a company who specialises in that sort of thing, and now we've got Sasha's Ashes in a little Ceramic Urn here at home with us; and they even gave us a Certificate with his name on it, and also with his date of Birth (12th of December, 2003) and his Date of Passing (21st of January, 2019): and also with some of his curly white hair attached! Aw: that's so nice, Carol!! I bet you're glad that you did that! 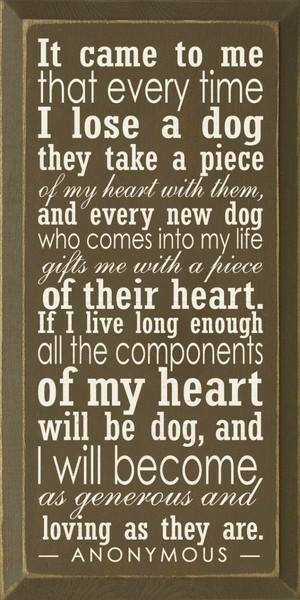 And of course: our pets will be in our hearts forever!! I adopted a cat when I was twelve (or rather it adopted me) and it got run over by a snow plow only a year later. That was terrible. I couldn't accept that he was dead, I kept thinking it was him whenever I saw a similar looking animal. I am not a cat person in general, but he was special. My mom had a horse for a while. He was chronically ill, which she knew when she took him, but when he eventually had to be put down, she was still devastated. It must be really awful to loose a dog. Dogs can be real friends to people in my opinion. Oh T.o.b.y, you poor thing!! That's terrible!! I'm so very sorry!! Yes, I know exactly what you mean: it is very hard to accept that our pets have gone: I'm still having trouble in coming to terms with it; And I'm very sorry also, to hear about your Mom's horse. Yes, you're right: Dogs become real friends, and part of the family; our little Sasha was just like our very own little Son! I don't think we'll ever fully recover from his passing. I'm so sorry for your loss, Douglas. I have a dog and keep dreading that day will come one day. I could hold him randomly and the dread is sometimes too strong to overcome. I had lost a number of dogs in the past, those were family dogs, as in I was only involved a bit here and there, yet it was devastating to lost them. The kick came when I couldn't keep my tears for three days when my own hamster died, and I could tell you that I almost never cried all my life. I put back the decision to adopt my own dog again and again, until one day a scrawny little guy really needed a home and I'm restless ever since. I'd like to think if I could exchange my years with his dog years, I'd gladly do so. It breaks my heart to see that I'm the centre of his universe and try my best to be deserving. Having said that, we lost a dog friend just couple of weeks ago. We always go for long walk on the beach and eventually, we've come to know many many stray resident dogs. With that, I'd try to bring something for them. Not much, but even so, you should see the delight and appreciation that weirdly, it's very natural now for any dog (even the ones we don't know) to come to us with or without food. Unlike the first time I had to try hard to strike a doggy friendship, it's difficult to walk a step without couple of them following now. Beside dogs, I have come to realize there is a 'hidden' community of fellow dog feeders. Slowly, unbeknownst to me at first, they started to treat me as their own and updating me about this dog and that dog, which I appreciate a lot, but it comes with a cost. Back then, I would miss a dog or two, when I didn't see them their usual spots or territories, sometimes they came back sometimes they didn't. I was worried, but tried to think that they probably took a walk somewhere or changed home. Some of those are true, but apparently now I know some are not. One of the most heartbreaking story was a dog we've known was killed by human, with some questionable justification. I don't want to talk about it though, beside the happy lives they seems to have, sometimes it's just, just unavoidable that some people choose to be what they are. At least, we keep a look out for each other when we could, and we try to put collars on every dog to minimize bad intentions. Anyway, I was away early of March, and on my last visit to the beach before that, this beach boy, his sister and mother (I happened to know them since puppy) were following me around as usual. I got a bit upset with them because they chose to leave their food to follow me which they didn't usually do because they love eating. Anyway, coming back two weeks after I didn't see them, except the mother that seemed very depressed. And I was told that the boy had died from car accident; his condition was so bad that he had to be euthanized after a couple of vet visit. The sister was okay, but was brought to the shelter temporarily. Anyway, the news was depressing but I thought I was still okay, until I knew I wasn't. I parted way with the news bearer and on the quiet spot, I couldn't control myself. For a couple of days afterwards, everytime I met the other feeders, we shared the same story, and I found out there were even more people that I didn't know before who would approach me about that and seemed very sad. And this is so-called, a homeless, unwanted dog who was abandoned by whoever had them in the first place. But unknown to many, he had touched so many people that we all miss him, even the dogs who acted differently. I made it a point to pay special attention to depressed mother because she knows, she really does. It took me a couple a visit before she finally wants to sit with me again like before. And just yesterday, someone made a small talk about my dog and said that she had lost hers and never able to get a replacement. I don't think there is such thing as replacement. Like everyone said, you'd know when you are ready, when the time comes, there will be another kindest species of them all who would make you the center of his/her universe, and it's worth all the pain, I hope. Thank you SO very much for this; it's very nice and kind of you, and I really do appreciate it. I'm so sorry for the pain and sadness that you went through, with the loss of your Hamster; that's terrible, that you had to go through that! I really am very sorry. I think it's wonderful, that you look after all of those doggies in need!! You sound like a very nice person!! There should be more people like you in the world today!! And I agree wholeheartedly with you, about there not being such a thing as a replacement: we will never replace our little Sasha: my wife and I haven't had children together, and so he was our very own little Son! He slept on the bed with us, and he wanted to be with us 24 hours a day; which he was!!! We loved him so much!!! So even if we do eventually get another dog, it will never replace Sasha! I believe that Sasha will give my wife and I a Sign: telling us that he's happy for us to get another dog!! So we will wait until then. So thank you so much, once again, for your heartfelt and sincere and thoughtful and kind words: I really do appreciate them. Thank you so much for your beautiful and kind words: I never expected such kindness; even though I have always felt this Forum it be very warm and welcoming and friendly! Take care: you're all wonderful people! In the space of a year, from October 2017 to August 2018, I lost three cats. They were all around the same age and they all developed kidney failure and I had to have them put down. After the first one was gone, I think the other two pined away from missing her and it hastened their ends. I still cry often, but I have finally got to the point where I'm not crying every day. I have been inconsolable and it's been a very dark time. Prior to becoming owned by cats, I've had three dogs over the years who have all crossed the Rainbow Bridge. I share in your sadness and know how hard it is. I hold onto the hope that I will see my pets again after I cross that Rainbow Bridge too. You will never stop missing your little buddy but it gets more manageable over time. I have another cat now, who showed up looking for a home just a few weeks after my final bereavement. I was not ready to take on another pet so soon and tried to harden my heart against her . . but she's living with me now, so I folded like a souffle in the rain. Having her around has helped, since I'm not the only living thing in the house. I had never been alone in my current house in the 15 years I lived there because I moved in with one cat and collected two more. When I was rattling around by myself trying not to look at the empty food bowls, it was a bad time. My kitty care routine has resumed, which is both good and bad. A break from cleaning the litter boxes was the sole upside to my losses. That and no more vomit on my carpeting. The current resident and I are still getting used to each other; she's not a cuddler and will ignore me for hours at a time. As I tell her often, she is never going to replace the ones that came before her. But having her around is a bit of comfort anyway. Maybe eventually you and your wife will feel ready to open your hearts again. Best. Thank you so much for your reply and for your kind words; I'm really sorry about your losses; that's awful; how heartbreaking for you!!! I can fully understand your pain, now that we've lost our Sasha; so I'm so very sorry. I think it's wonderful, that you do have another cat now; however; good on you! I think that's very strong of you, and don't worry: I'm sure that your new cat will become a Cuddler soon; you sound like a very good and nice parent. Once again: I'm so sorry to hear of your losses, and I hope you're coping all right; my wife and I are still trying to come to terms with the fact that our little Sasha is not here with us physically, anymore; but I agree with you: we also hope to meet him once we cross The Rainbow Bridge: in fact, we can't wait to see him again! So thanks very much, once again, Hikari. Some cats are simply not cuddlers, but that doesn't mean they aren't affectionate. One of our cats, who has lived with us since she was a tiny kitten, has never been a lap kitty and doesn't particularly care to be picked up and cuddled either (though she'll sometimes tolerate it for about fifteen seconds). But she loves sitting next to us on the couch or curling up next to us in bed -- when she's in the mood. She does need to spend a certain amount of time with her own feline activities, just as Alex and I will sometimes go off and tend to our human affairs. I'm so sad and sorry to hear of your losses; that's terrible; I'm glad that you've got a new kitty now, and yes; our pets love bossing us around; don't they!! Thanks, Douglas. One of these days I'll get around to posting a picture of her.